Sometimes there's really nothing better than throwing on a sweater dress and boots and heading out the door. Case in point, the outfit below. I threw on a faux fur vest to make sure I wasn't mistaken as catwoman but it definitely made for an easy Friday work outfit (that transitions well to post-work shenanigans no less!). What's your go-to winter outfit? This is such a perfect go to winter look. I usually throw on a dress and tights and boots. I am such a dress girl. I love your fur vest! 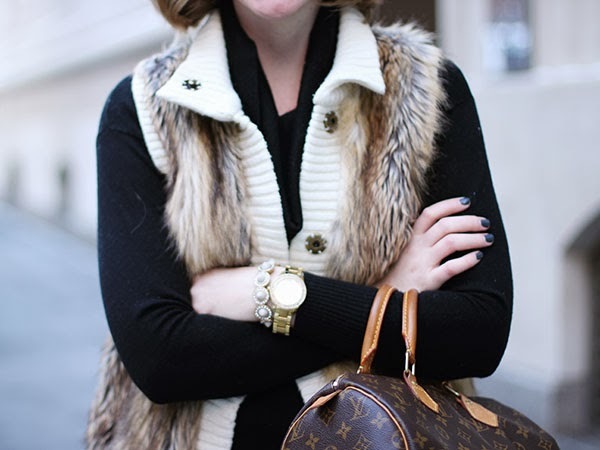 I love the trim on the vest - it keeps it chic without looking too diva. Such a great look!